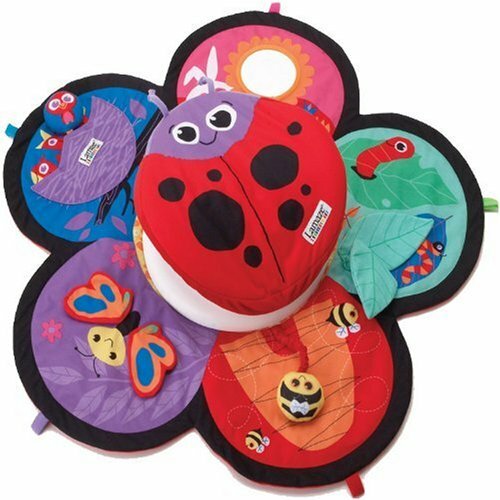 I first saw the Lamaze Spin and Explore Garden Gym for sale on Amazon when Little Man was just under five months old. At the time, we were doing a lot of tummy time, but he was starting to get frustrated by it because he was able to hold his head and shoulders up, but he couldn’t move! I thought this might be the perfect solution to help him enjoy tummy time a little more, so I ordered it. 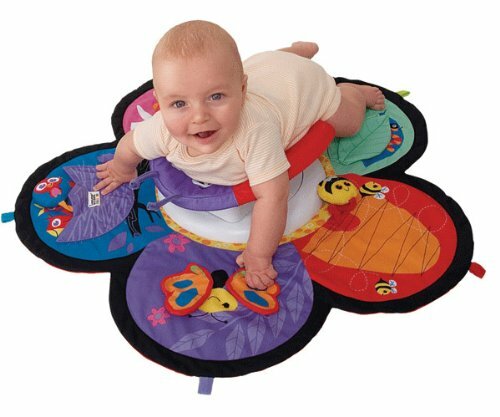 The colourful play mat has lots to entertain baby – squeaky toys, crinkly toys, flaps to lift and explore, and best of all a mirror to look in. In the centre of the mat, a saddle shaped spinner sits. You lay baby on his tummy on the spinner and then baby can use his arms, and his feet to spin around and play with all the different sections of the mat. I was so disappointed when it arrived to discover that he was already too big for it! His torso was just too long for the spinner. On the review I had read, it said that it was suitable for up to six months, so I thought we would get a month or more out of it, but really I think that the age recommendation includes a period of time when baby will no longer use the spinner, but will just sit in the centre of the mat and play with the toys. I think that if we had bought this a couple of months earlier, we would have got quite a lot of use and enjoyment out of it. It really seemed well made, and the different toys for baby to play with were bright and colourful and certainly held his interest.